Cuckfield is a large village in the Mid-Sussex District, the nearest town being Haywards Heath. Unless you live or work there, it’s one of those Sussex villages which you’ve heard of but never been or know anything about. Well, that was my experience anyway. When my boyfriend suggested going for dinner on a cold, wet Thursday night to ‘somewhere different’ I was a bit dubious. He said a colleague had recommended a pub in Cuckfield called the Talbot. I was imagining getting lost down narrow, windy country lanes, and ending up having to get McDonalds at a drive thru on our way home. But I thought I would go with the flow and give him and his colleague the benefit of the doubt. So, we typed the postcode into the sat nav and set off. Half an hour later and only just off the A23 we arrived in the village of Cuckfield: apparently named after it’s emblem, the cuckoo. 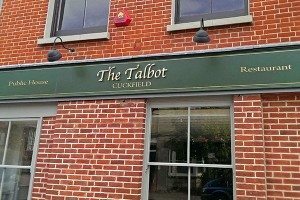 We found the Talbot very easily as it seemed to stand out in the typically quaint Sussex village high street. There was a lovely courtyard to the right of the pub which I imagined would be popular in the summer. As we walked in through the courtyard entrance the bar was right ahead seating lots of happy looking locals sipping their ale. The cheerful barman smiled at us and pointed us towards the restaurant which was to the right. I walked past a gorgeous old, dark wooden dresser on my left and up to the host bar where another member of staff smiled at us warmly. We were greeted and seated straight away in the light and spacious, surprisingly modern restaurant. Due to the location I presumed we would be eating in an ‘olde worlde’ inn where it was all low beams and ancient artefacts. Although, there were still glimmers of ‘vintage’, it was actually very modern. Cream coloured walls and furniture, wooden tables and large emerald green plants in each corner. Unusual copper sphere lanterns hung from the ceiling. Though modern, the decor still reflected it’s rural setting. There were paintings on the wall sold by a local artist. All depicted farm animals and Sussex wildlife. It gave the room a homely, local feel. We sat down comfortably in the corner and looked at the menu. There were 7 starters and at least 15 mains to choose from not including the specials. I was told by our waitress that the menu is changing constantly. When I asked her to elaborate on this, she explained that if we were to come back on Saturday night, the menu would not be the same. Impressive. It also suggests to me that as well as creativity, freshness of ingredients is important to them. I was told by the chef that everything on the menu is homemade using fresh, locally sourced and seasonal ingredients. The only items that aren’t made in house are the bread and the ice-cream. It was very hard to choose a starter as each one looked so tempting. Eventually we decided to go for the Pigs Cheeks (rolled in pistachio, creamy puy lentils, apple jelly and jus)and the Oxford Blue Cheese Tart (walnut short crust, pear relish, micro herb salad and red wine glaze). When we ordered, the waitress smiled as if to say we had made great choices and that she was excited for us. I had a feeling this was going to be good. When the starters arrived, we were both very impressed with the presentation. Plus they were perfectly arranged for sharing. One cheek each. However, when it came to handing the other cheek over, I was a bit reluctant. The pork was so tender and succulent, it barely needed chewing. The texture of the pistachios and the ‘al dente’ lentils were a lovely contrast. As for the taste, it was like a mini explosion of Sunday roast pork. Very comforting and satisfying. 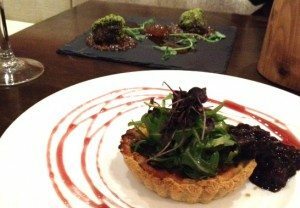 Although I was reluctant to share this mouth watering starter, when I did and in return I got to try the Oxford Blue Cheese tart I was equally as happy. Again, the contrasting flavours and textures were harmonious: the creaminess of the Oxford blue with the crumbly texture of the walnut shortcrust and the strong, pungent taste with the sweetness of the pear chutney. If you’re not a major fan of blue cheese, I would argue you might still like this, as the Oxford blue wasn’t overpowering and quite subtle. I would have ordered it for the pear chutney alone. Both starters went beautifully with the wines we chose from the lengthy and interesting wine menu. Although not an ale drinker myself, I did notice the number of regional ales they had on tap. Which may have explained the number of happy looking drinkers sitting at the bar on a Thursday night. With our appetites well and truly whetted, we waited for the mains. 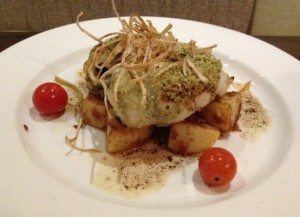 I had gone for the Plaice and Garlic Spinach Paupiettes (with mustard and herb crumb, crushed potatoes, beurre noisette and crispy leeks). 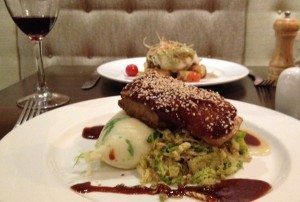 Tommy went for the Sesame Glazed BBQ Pork Belly (with cheddar and spring onion mash, apple sauce, peppered savoy and jus). Yes, our mouths watered just reading it too. Both dishes lived up to expectation. They were full of flavour and colour and both were generously sized portions. The Sesame Glazed BBQ Pork was a smorgasbord of cuisines. The sesame glaze gave it an oriental flavour. The BBQ sauce a taste of the deep south, and the cheesy spring onion mash gave it a British touch. 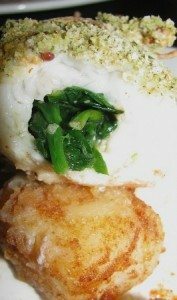 The Plaice paupiettes were something I’d never heard of before, but contained all my favourite ingredients: fish, spinach, garlic, potatoes and leeks. The fish was so soft I could tell it was unbelievably fresh. Wrapped around the garlic infused spinach, each mouthful of ‘paupiette’ was pure pleasure. The crispy leeks gave the dish an added crunch of flavour. Both of us finished our mains very full and very satisfied. Being true foodies however, we couldn’t ignore the dessert menu. Tommy predictably went for the one which mentioned chocolate four times: Dark, White and Milk Chocolate Panna Cotta, chocolate and hazelnut soil. I went for the De-constructed Banoffee pie, banana caramel, ginger biscuit ice cream, banana cream and caramel powder. I cannot resist banoffee pie so I was intrigued to find out what difference deconstructing it can make. Again, when we gave the waitress our choices, she smiled and looked pleased for us for what we were about to experience. Both desserts were brought out beautifully positioned on a square of slate. Pretty as a picture. Tommy’s chocolate panna cottas were as smooth as silk and tasted so decadently rich, it almost went to your head. But in a good way. It was not too much, but enough. The deconstructed banoffee pie was more of a surprise than I imagined. 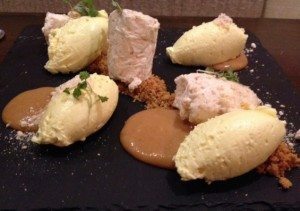 There were scoops of banana flavoured whipped cream, ginger biscuit ice cream, swirls of banana caramel and sprinklings of caramel powder. All the fantastic flavours of the English classic but in a totally different format. I’ve not had a pudding like it anywhere else. I left the Talbot feeling full and happy, and with a new view of Cuckfield: somewhere worth the drive to, no matter what day of the week or whatever the weather.